How To Shape Eyebrows In The Right Proportions! Eyebrows frame the eyes and face. Here's how to shape eyebrows in a way that makes the most of that frame. Too thin can look unnatural, while keeping them too bushy can seem unkempt. The most affordable and simple method for eyebrow shaping has to be our trusted tweezers...An extension of your fingers that takes only as much hair as you need, then elegantly and (just a little) painfully pulls them out! If you’ll be coloring your eyebrows, check out some advice on tinting- before learning how to shape eyebrows. An extra pencil for measuring dimensions will be helpful. For less painful tweezing, it helps to have a warm compress that you’ll keep using on the area being tweezed. Warming the skin will open up the pores, and let the hairs slide out easier. Tweeze individual hairs so that the shape can be more exact. Every hair makes a difference to the eyebrow shape. It also helps to mark the shape you'll be making with a pencil before tweezing. It helps you to see whole picture while going through the guide. If it seems like too much work, remember you'll only be doing it once. The rest of the time you'll just be touching up the original shape. There are three points that you will need to look at when shaping. The beginning (inside) of the brow, the arch, and the end of the brow. Step 1: Place a pencil in a straight line along the side of your nose as pictured below. Hairs that are on the inside of this line will go. Carefully tweeze these one hair at a time to avoid overplucking. Step 3: Look straight ahead of you. Place the pencil along your nose, and across your pupil. This is going to be the highest part of your brow, the arch. In most people, you will find that the arch is already naturally defined. Something to consider when determining the ideal thickness of your eyebrows. Delicate features will most probably look better with thinner brows. 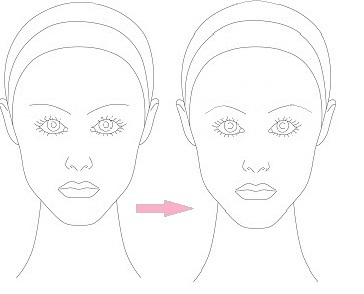 If you have a fuller jaw and face on the other hand, thicker lashes will do you more justice. 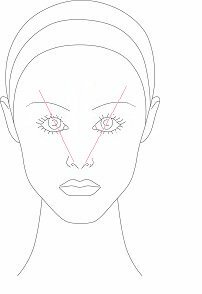 Determine the shape that leads to the arch with an eyeliner pencil and tweeze the hairs beneath this line. You will then brush all the brow hairs downwards. Some of them are going to be sticking out below the line. Trim them placing your brow scissors sideways. This is because you just want to get the small tips off, not cut off the hairs completely. There musn’t be a sharp angle at the arch. It’s just the point of reference where the bottom of the brows start to turn downwards. 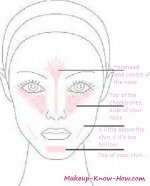 You will then brush the brow hairs upwards, and trim those that stick out from the top brow line. Remember that the lashes in the illustration are purely to demonstrate a difference in the effect on the face. They should never be that thin... Ever. Alternatively, there is the professional route. This is if you're considering eyebrow threading, electrolysis, or laser hair removal. They're all bit(sorry, I meant a lot) pricier and mean much less effort for you. Unfortunately though- you don't get less pain. Step 4: Finally, Brush your eyebrows upwards and out. This will help you to see where there might be bald patches. Fill these in with lash like strokes of the eye pencil, or eye shadow that matches the color of you brows. All you need to do now is maintain the brows perhaps on a weekly basis, or as often as you need.